Corporate social networking with web 2.0? In "Inexpensive way to recover your laptop data" I mentioned my laptop broke and I was doing the rounds of computer stores looking for another. I ended up buying a Twinhead 12D. 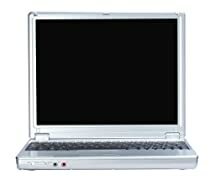 This has a 12.1" screen, a pretty ordinary Intel Centrino 1.73G, 512MB of RAM, 80GB of Hard Disk and DVD Dual Layer Burner. It has a white shiny case like an Apple notebook. As well as a SD card reader (for the card from my phone) it has a larger PC Card slot, which is handy for some old full size cards I have. But it has wireless built in so I will not need my old wireless card. The screen is not particularly high resolution but is okay for a 12" unit. They display looks good with my 24" Dell monitor plugged in. I was going to buy a Twinhead 12KF, but "Phil" at Q Plus Computers in Sydney convinced me that the 12D's Intel processor was more power efficient than the 12KF's AMD and worth a few hundred more dollars. He also showed me the smaller Twinheads with 12" widescreen and 10" widescreen. The 12" widescreen was only a few cm smaller than the regular 12", about the same weight and hundreds of dollars more (if somewhat more powerful). The 10" was more expensive and too small. I paid for the 12D on the spot and had a coffee next door while it was set up for me. Twinhead had a special on, so I got a wireless mouse, screen cleaning kit and carry bag thrown in. The last thing I need is another wireless mouse (I like mice with cables so you don't have to worry about batteries and can't loose the mouse). The cleaning kit may come in handy for the Twinhead's shiny white case (I would have preferred a grey case). The carry bag is very useful, being much smaller than the typical computer bag, but having room for the Twinhead and accessories. I left the cardboard box and packing behind and carried the unit out in the shoulder bag. On the bus was another person with an enormous and heavy looking computer bag; I felt smugly superior. The web makes a very useful resource when buying a hi-tech product. But there is not a lot of information about Twinhead computers online. I ended up with a review in German translated automatically. Along the way in forums I learnt the Twinhead is also called a Phillips X50 in the UK. The Phillips X50 owners do not seem very happy due to a lack of support. Someone needs to tell them to look up "Twinhead" or "Averatec" (as they are known in the USA). Also there is support for Linux from the community. The Twinhead web site was useful and they emailed me about suppliers in Sydney. I emailed two stores, but only one replied promptly (the other only answered after I had bought a unit). While the web is useful for buying a computer, some hands on advice is good. Capitol Square in Sydney has several stores specalising in laptops and is worth a browse.